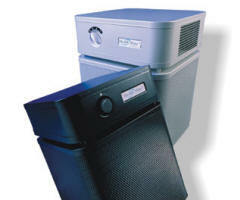 The Austin Air HealthMate HEPA Air Cleaner sets the standard for all others. With a proven 20 year track record, the HealthMate line of air cleaners are designed for people that are concerned about their air quality. The all metal construction and powder coat finish eliminate worries from VOC off gassing. 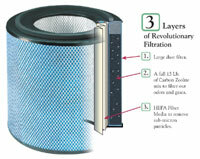 The true medical HEPA air filter and carbon and zeolite blend remove odors, particles, gasses and chemicals. The Austin Air HealthMate is all-around air cleaning, with 4 filter stages to deal a complete spectrum of airborne contaminants: particles, noxious gases and odors, and various chemicals. The true medical HEPA and carbon/zeolite blend filters make this the perfect air purifier for everyday home air cleaning. Removes odors as well as particles. Stage 1 - Large Particle Pre-filter - The first stage of air filtration removes particles large enough to be seen with the naked eye. This includes pet hair and household dust. The Austin Air Healthmate Warranty is the one of the best in the industry. A full 5 year mechanical warranty lets you rest assured that your air cleaner will operate reliably and trouble-free. Air flow from 75-400 cubic feet per minute Easy roll casters make it portable.